Many, many years ago I purchased a GoPro camera not knowing much about it, in fact very few people had even heard of it at that time. Since then GoPro has continually built and enhanced its reputation to become the leader in high quality personal action cameras. Today you can see these small yet amazing cameras being used by professionals as well the weekend warriors during every adventure, sport or event you can think of. A mainstay of the extreme athletes and X Games participants, the line of GoPro products has become the camera of choice for all individuals who want to document and share their exploits. I won’t go into excessive detail on the specs of this amazing little camera but you will learn much about it from my own search for an action camera that suited my individual needs. Variety of use was a key factor in my choice, as the founder of TheOutdoorsGuy adventure blog, my exploits could take me from the highest mountains of Nepal to the warm colorful reefs of the Florida Keys, I could be hunting Antelope in Wyoming or fighting a blue marlin off the Bahamas, so versatility and convenience along with size was of the utmost importance for me. The GoPro Hero3 Black edition was easily my first choice. I love the vibrant colors and intricate details of many of my adventures and this camera allows me to better capture it the way I see or experience it. The Hero3 Black edition can not only shoot lower resolution video, it can also shoot 720P at 120 frames per second and 1080P at 60 frames per second and 2.7k at 30 fps. It can also boast of the ability to shoot 4K video at 15 frames per second, but to be honest I can’t see me personally having the need for that, then again, years ago I never thought I’d own an iPhone either, yet here I am with my 4th one! Basically, the GoPro Hero3 Black edition can give me everything I really need in an action camera from ridiculously hi resolution to incredible slow motion in a really compact and easy to use form. 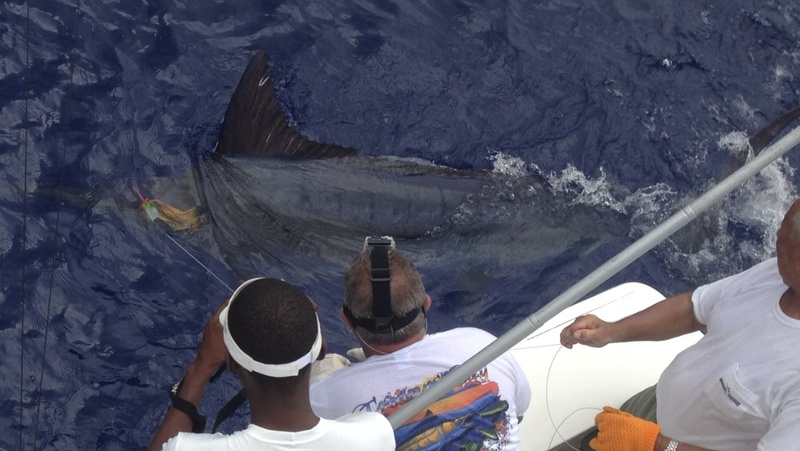 Mitch Dinnerman uses a GoPro Hero3 while attending to more pressing tasks, A 500lb Blue Marlin! GoPro’s ability to be used in almost any endeavor is due largely to its amazing variety of mounting options. There is pretty much a way to mount the darn thing for any type of sport or hobby you want to capture on video. Whether you are surfing, Fishing, snorkeling, hiking or pretty much anything you can think of there is probably a mounting option that will fit your needs. Combine the mounting options with a remote that has WiFi capability and you can then operate your camera (and up to 50 others) from 600’ away! The WiFi Remote is included in the Black edition and is waterproof. What I really like about the WiFi remote ability is that I can also control it with my iPad when I’m using the GoPro app! In addition to everything else I’ve mentioned there are a wide variety of accessories that make this camera even more attractive. I love the LCD touch BacPac that allows me to have an LCD touch screen when needed without significantly altering size and weight of the entire unit. I can instantly control my setting and preview my pictures and videos with just a touch. If you have previously owned a GoPro camera I will just repeat what is written on the GoPro website about the Hero3 Black Edition, Smaller…Lighter…Better! If you are really into the exact specs on this Camera, here is the link to the GoPro website and the manufactures specs on the GoPro Hero3 Black Edition. Also keep checking on the featured video page of TheOutdoorsGuy.com to see some of my adventures captured with this camera! Remember, Its not bragging if you can do it! 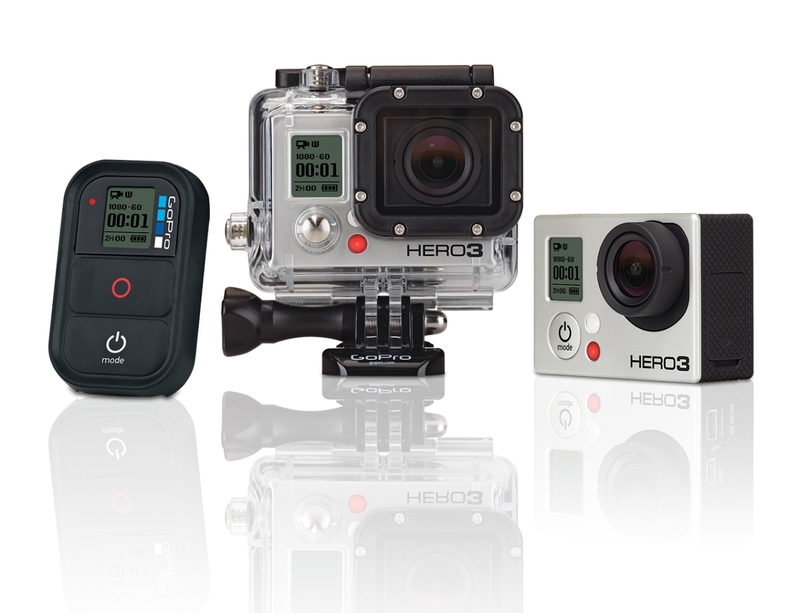 » Equipment/Reviews » GoPro Hero3 Black Edition – It ain’t bragging if you have video!